Shipping for up to 5 prints is approximately $40.00 depending on your location and includes $100.00 insurance. Additional insurance is $2.25 per $100.00 . 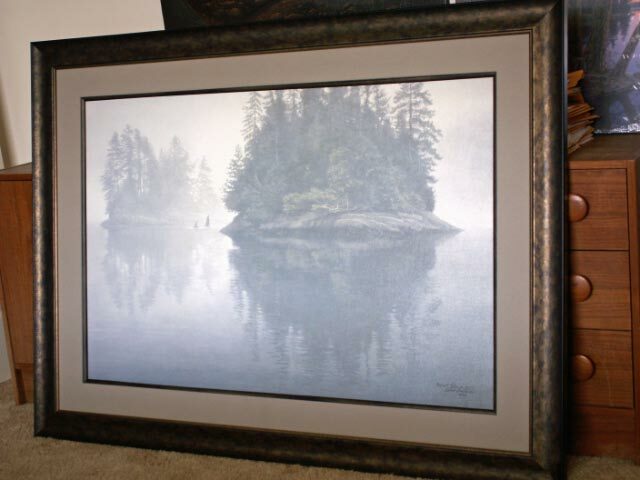 Please inquire for shipping price for framed prints. 11 am to 8 pm Monday through Saturday. Form: limited edition Offset Lithograph on paper. Edition Size: 1250 numbered and hand signed by the artist. 5 available - New mint condition. ​Includes insured shipping up to $100. One element echoes through all Darrell Bush's work: The luminous presence of light. It sets the mood, warms the heart, calms the soul. Born in East Moline, Illinois, Darrell enjoyed hunting and fishing with his family as a child so he's experienced the warm glow of the perfect Midwestern sunrise and seen the rays as they dance of the lake and shore at sunset. It's all here waiting to please your eye. Evening Performance is of a cabin sitting with beautiful light show up above it. 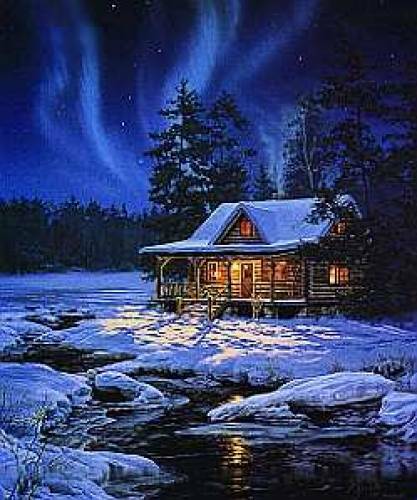 The colours used by the artist are beautiful as you see the navy blue sky bring out the light blue and white lights shining above and give a wonderful light show for the people in the small cabin below. 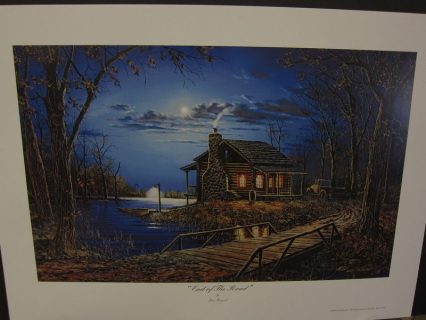 The cabin sits on a north country lake near a stream. # 9 - Frame only. 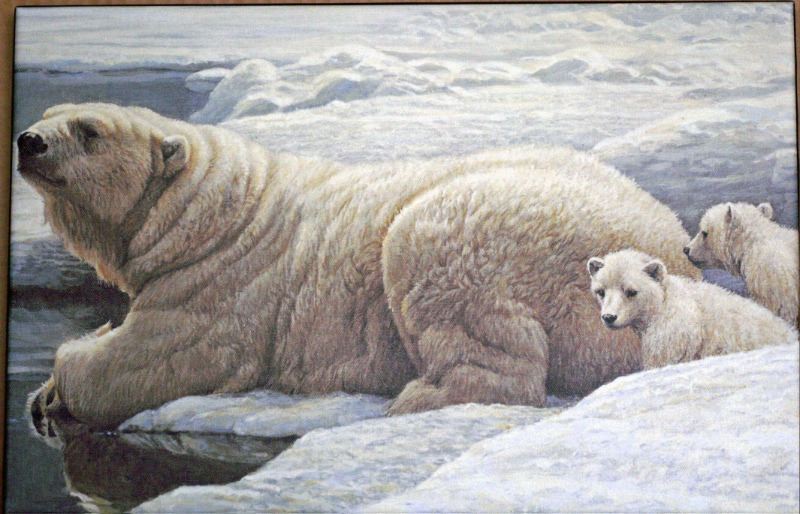 This fits Robert Bateman - Tsitika and Her Son and Winter Sunset - Moose and many other art canvases. This is a high quality custom gallery made frame. 1 available - New mint condition. # 11 - Denis Mayer - Pride Of The Amazon # 16/50 Gallery Edition. Edition Size: 50 numbered and hand signed by the artist. Includes insured shipping up to $100. additional insurance can be purchased @$2.25 per $100. of a lithe black jaguar, the pride of the rain forestj reclining on a branch rising high above the jungle. Image size (inches): 18" x 24"
Edition Size: 999 numbered and hand signed by the artist. ~ “While painting this scene,” says the artist, “I was transported back to the north country, with its sights and sounds, and the smell of evergreens and the memory of this bear I saw along the lakeshore as I paddled toward camp one calm summer evening.” About the Artist : To view an Al Agnew original is to be given the gift of a moment suspended in time. Wildlife artist Al Agnew captures the essence of wildlife in colors and emotions on painted canvases. 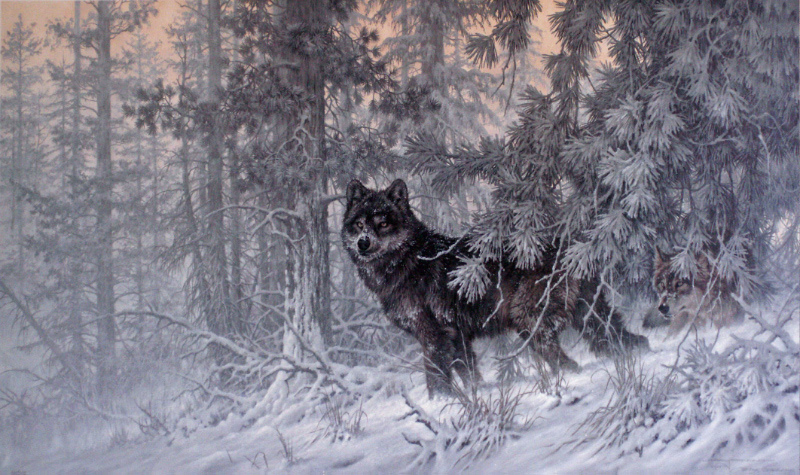 Whether on safari in Kenya, Tanzania or Zimbabwe, or on a trek across the wilds of Alaska, Agnew focuses all his attention on his subjects with the intensity of a predator. The sights, the sounds, the air that is breathed are channeled from the mind’s eye to the stroke of his brush on the board. Edition Size: 950 signed by the artist. 1 available - New mint condition with certificate and print folder. There are 3 wolves in this image . This is one of Tribigers best and a rare find. "For as long as I can remember, I have always enjoyed being outdoors in the wilderness. As a boy, I dearly loved to spend Saturdays and school holidays roaming the beautiful rugged countryside around the dairy farm near Kelowna, where I was raised. 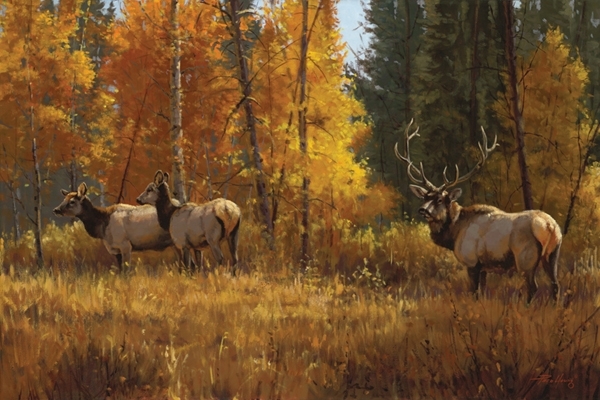 Today, wildlife has become the prime subject in most of my paintings. 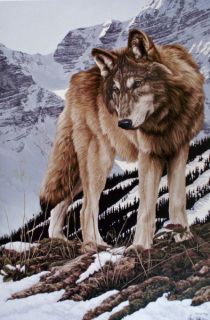 When painting animals, I strive for depth creating distance so one can see past the animals. Yet I try to capture the expression of the animals' eyes. Edition Size: 650 numbered and hand signed by the artist. 1 available - New mint condition with print folder and certificate of authenticity. 1 available - New mint condition . Includes insured shipping up to $100. 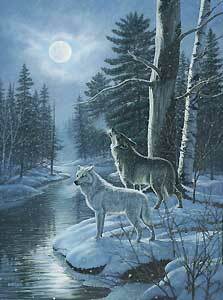 ~ As autumn approaches in the north country, the wolves understand that winter is not far behind. They sense that warm Indian summer evenings, like the one portrayed here, will soon be a thing of the past. "The beautiful creatures are smart and instinctively know that cold weather is just around the corner. 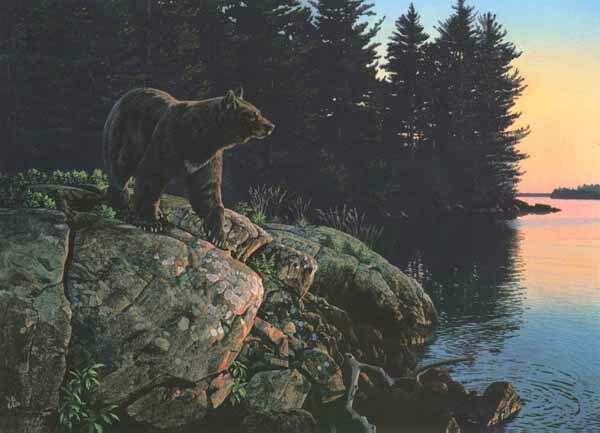 So they pause for a moment on a bare rock ridge, soaking up the warmth while catching the cool breeze off the lake." Edition Size: 1200 numbered and hand signed by the artist. Form: limited edition Serigraph on paper. Edition Size: 395 numbered and hand signed by the artist.1 available - New mint condition with print folder and certificate of authenticity. By beloved Modern Art Master, Roy Besser This exquisite top quality Serigraph is created on silky smooth heavy artist`s Paper. Roy Besser is one of America`s most famous modern masters. His stunning and stylish Illustrative technique has been at the core of literally thousands of images and ad campaigns, for the likes of Pepsi Cola, Max Factor, Mercedes Benz and Coca Cola...BESSER`s incredible resume includes nearly every major Hollywood Studio, as well! Thousands of titles in vast body of work have become extremely collectible. 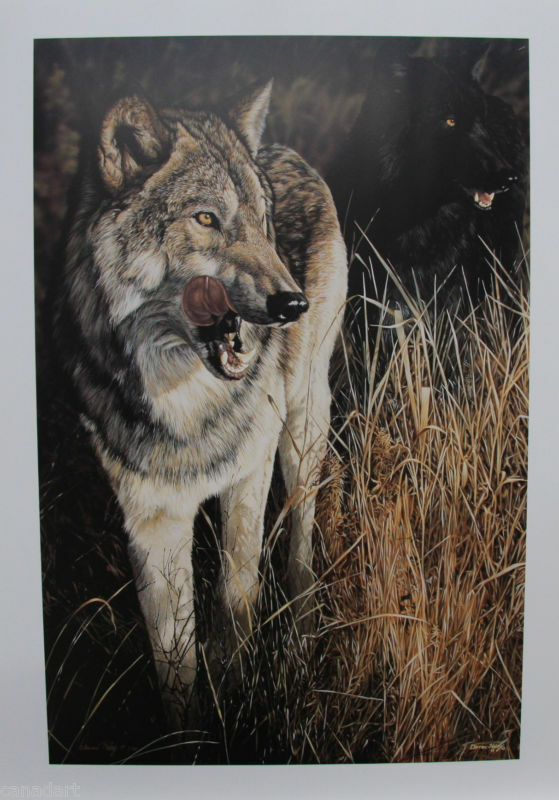 Edition Size: 950 numbered and hand signed by the artist. 1 available - New mint condition with certificate of authenticity and print folder. 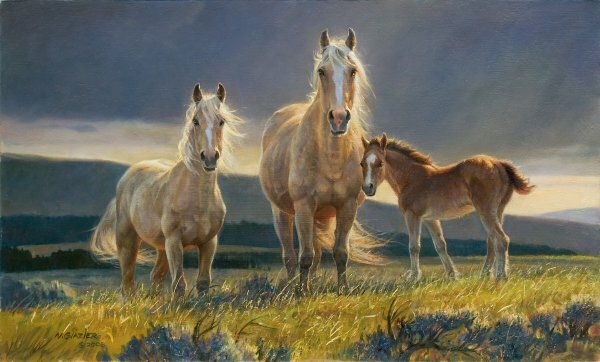 "This is the first time I have painted the Palomino horse, but it will not be the last!!! What a joyful experience this painting has given me! My hope is that this energy will flow outward from my easel...that this joy will be passed on. I enjoyed every moment of the creative process with GOLDEN GLORY - from the research through sketching and composing, then creating the most supportive background almost "out of thin air" as it were. However, the most exciting experience for me as an artist was coming up with just the "right" quality of light, which actually took the most time and focus. mother, the central horse? Or will it become more silvery like the filly on the left? Or perhaps, it will stay dark and velvety??? 1 available - excellent condition. This is a hard to find show poster that frames up beautifully and is a great alternative to paying $2000. + for a signed and numbered print. This measures 19"x 25".I have only this one left. This will be shipped free,flat and secure. Form: limited edition Offset Lithograph on paper.. Edition Size: 750 numbered and hand signed by the artist. 1 available - New mint condition. Has very small crease on outside edge of border that will not be seen when framed. Form:open edition Offset Lithograph on paper. Edition Size: open edition. plate signed by the artist. 10 available - New mint condition. This is for the print only, I have only shown it framed for illustration purpose. This is a rare find and is in new mint condition on very thick quality paper and the colors are awesome. New mint condition stretched and mounted on a stretcher bar. Breathtaking realism, uncompromising authenticity, attention to minute detail-these are the qualities that set Kim Norlien's paintings apart from the field. His award-winning wildlife scenes invite viewers to peacefully gaze upon wildlife in their natural state. Equally captivating are nostalgic pieces which capture the joy and simplicity of days gone by. Each Norlien painting is painstakingly researched to ensure that every detail whether it be architecture, landscape or wildlife is captured precisely as it would be found in Mother Nature's domain. Painting predominately in acrylics, Mr. Norlien complements his technical detail with skillful interplay of light and shadow. The result is subtle, yet powerful- vibrant, lifelike, compelling. Mint new condition; stretched and mounted on a stretcher frame. Can be hung as it is. 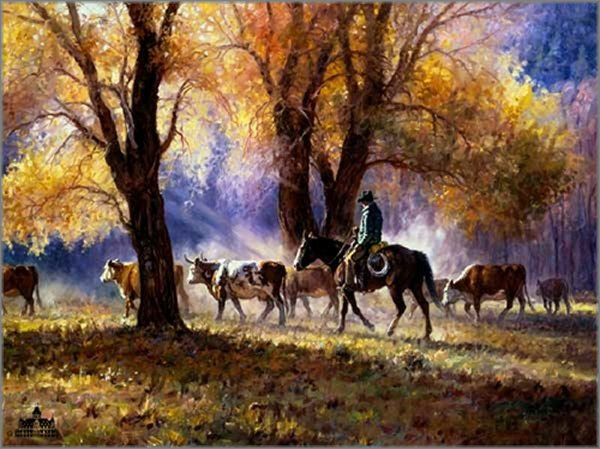 Image size (inches): 22" X 28"
Edition Size: 395 numbered and hand signed by the artist. 2 available - New mint condition with print folder and documentation. The talent of British artist Donald Grant was apparent from an early age. He sold his first painting when he was nine years old to his family doctor. 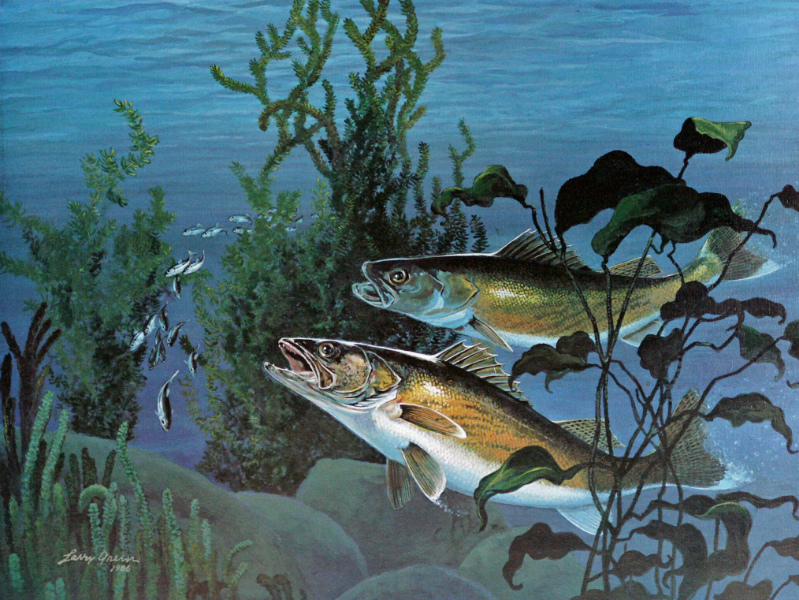 While still a schoolboy, Grant also painted a large mural in a public building and won a national drawing and design competition in the same year. 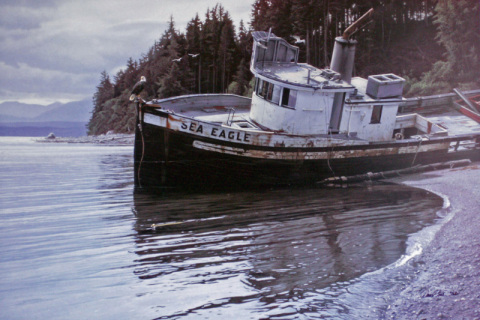 Continuing to paint at every opportunity, Grant followed a varied career, which began with the discipline of a long apprenticeship as a shipbuilding draftsman and continued with Army service in Africa. He also worked as a technical illustrator, a graphic designer and a free-lance advertising artist. 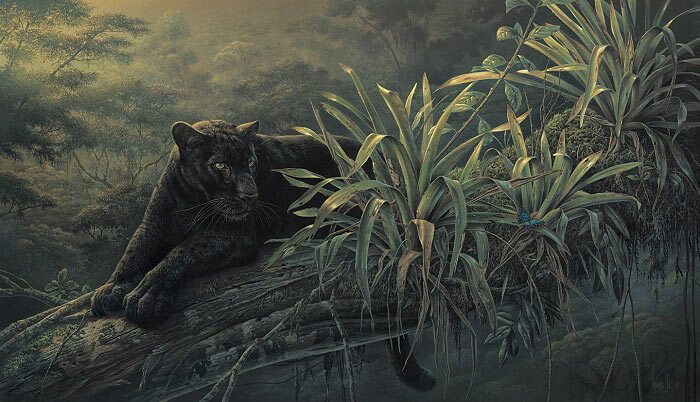 His masterful interpretation of wildlife subjects made Grant an artist of stature respected worldwide. His paintings have been internationally exhibited and collected since 1970. His technical perfection and ability to capture the look and feel of the African wilderness and the wildlife it supports were capabilities that could only be acquired through a love of Africa, best described by his own words: "Here in this magnificent setting, which we should all do our utmost to protect, the finely balanced day-to-day drama of survival unfolds." 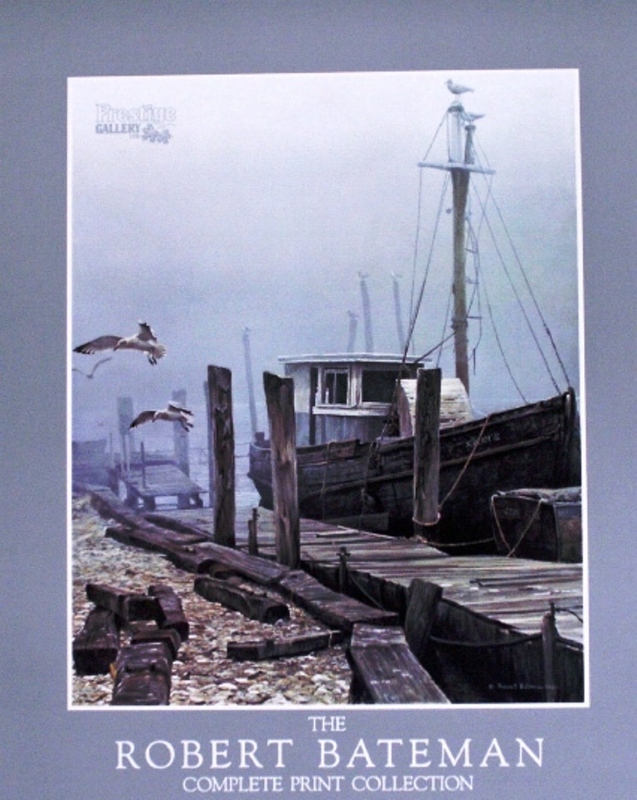 Grant's original paintings and limited edition prints, first published by Mill Pond Press in 1988, are infused with dramatic light and charged with atmosphere. 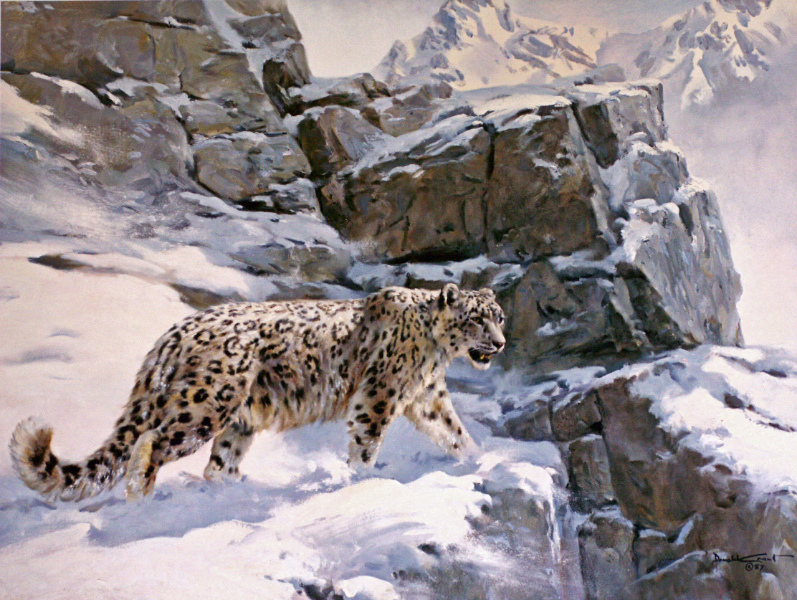 His subjects, with poses so characteristic of the species they represent, reveal the hand of a masterful artist; one who possessed a unique understanding of and genuine concern for the earth's endangered wildlife. After a relaxing ride in the canoe, a camper settles down for a cozy evening by the fire before calling it a day. The crisp, cool air is turning the leaves into the brilliant colours of autumn. The sunset completes this scene by adding its golden hues to the sky which are reflected in the pristline waters of the lake. 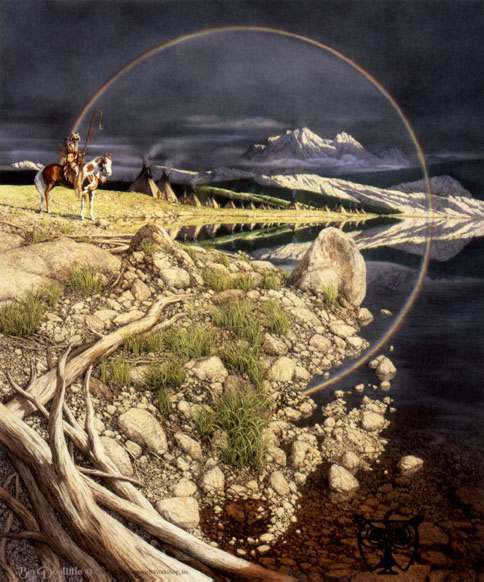 A Kansas-born artist, Larry Fanning now resides in Colorado, near the Western wilderness that he loves. He says about it; "In its richly endowed land, its wildlife, and in the dreams of it's people, there pulses an energy that is sacred and life-giving." 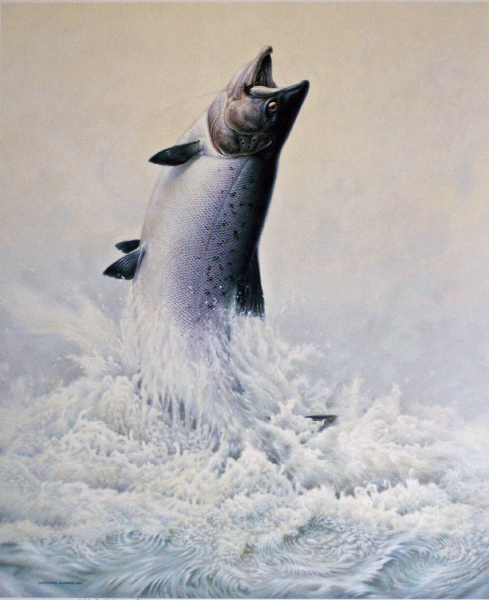 Self-taught, Fanning has an understanding of the animals he paints; a feeling for their anatomy that shows in the natural positioning of his subjects. Color is also instinctive to him, making his subjects come to life in his art, prints and posters. Great care is also taken to ensure the accuracy of the background in all his art, prints and posters. While Fanning draws from different experiences for his compositions, you will find that every detail is just right, you'll feel the snow stinging your face or the breeze blowing through. Edition Size: 35000 numbered and hand signed by the artist. Edition Size: 40192 numbered and hand signed by the artist. Edition Size: 100 numbered and hand signed by the artist. With a captivating gaze, this beautiful gray wolf noses around frozen mountainous terrain in artist Darren Haley's Alpine Hunter - a piece for which he has been named DUC's 2009 Artist of the Year. Has very small crease on outside edge of border that will not be seen when framed. Edition Size: 3500 numbered and hand signed by the artist. 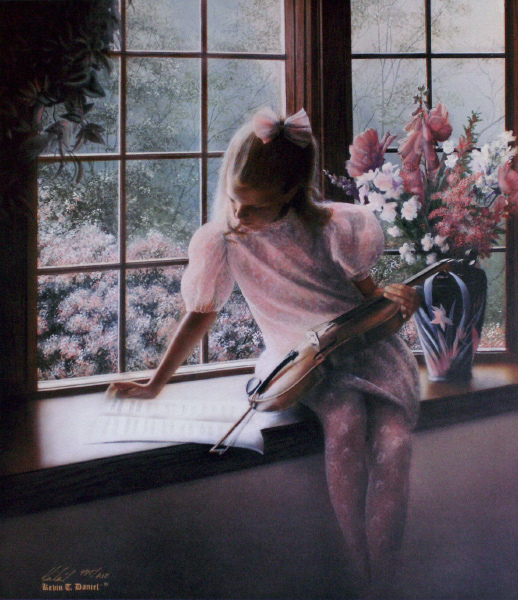 A young girl sits near the front window and studies her sheet music. She is getting ready for an upcoming recital. She is very good at the Violin and practices almost every day. This is a great Musical and violin art print with children. 1 available - New mint condition with certificate of authenticity. 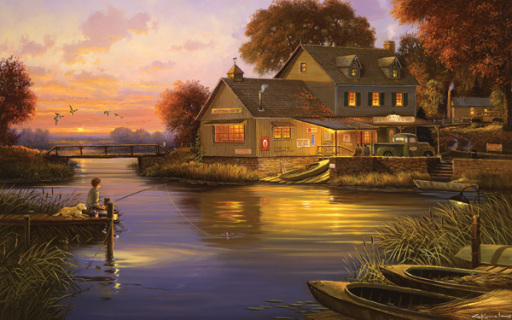 A sense of serenity permeates the beautiful landscape images created by artist, David Daase. Precision of detail and line, expertly combined with creative use of light, colour and composition, result in works rich in character , depth and beauty. Far beyond just painting scenery, David captures the heart of nature by drawing the viewer into the place he himself envisions as he unveils small corners of God's awesome creation. Born in Chilliwack, B.C. David grew up surrounded by scenic coastal mountains. 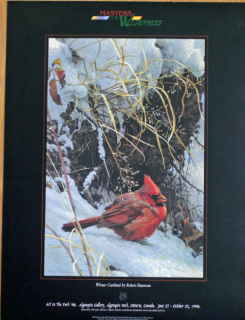 His love of nature and the outdoors inspired him to begin drawing at quite an early age. His artistic ability became increasingly evident as he progressed through grade school, and at the age of thirteen he began painting in oils. An accomplished musician as well, David found his time was divided. Over the years, the demand for David's work continued to increase, and art classes, which he offered for a short time, had to make way for concentrated effort on his own works. David makes his home in the heart of B.C. 's beautiful Okanagan Valley. He currently resides in Kelowna with his wife and three daughters, where he has built his reputation as one of Western Canada's finest landscape artists. 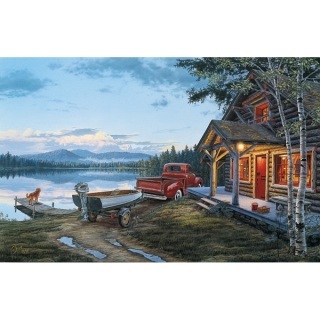 His paintings and limited edition prints can be found in private collections and galleries throughout Canada and abroad. Image size (inches): 20" x 30"
Edition Size: 495 numbered and hand signed by the artist. Is there any species more powerful and well "designed" than the tiger? 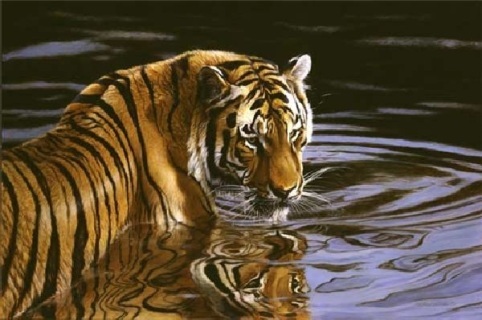 Hillier's elegant portrait gives us the added dimension of the reflections of the animal's stripes in the water. The tiger is alive; the water is rippling around him. And you are right there. Hillier's special talent lies in taking us right into the water with the tiger -- and at no peril or risk to us! This is a hard to find show poster that frames up beautifully and is a great alternative to paying $2000. + for a signed and numbered print. I have only this one left. This awesome piece measures 18"x24". Edition Size: 3 numbered and hand signed by the artist. Darren Haley was Ducks Unlimited Artist of the Year for 1999 , 2000 , 2009 and this year 2010 " Most pieces stem from a background I've viewed ," he says. " Whether it's a mountain vista , a church window or something as simple as a fence, I imagine what would be in that setting had I come at a different time." Haley says it was extremely exciting to win top spot - and knowing that his work is raising funds for wetland conservation is just as rewarding. A dedicated naturalist , he acknowledges renowned artist and DUC supporter Robert Bateman as one of his major influences. 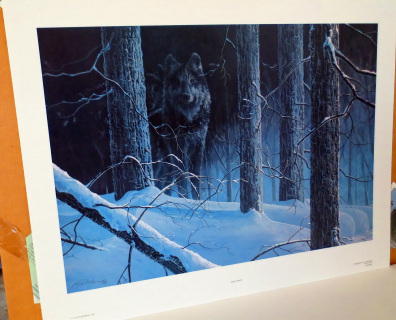 Edition Size: 50 Artist Proof numbered and hand signed by the artist. 5 available - New mint condition with certificate of authenticity. Autumn Brilliance by Paco Young ~ A rutting Bull Elk with two cows in the Pacific Northwest. The fall colors have arrived and the mating season is in full swing. A true outdoors man of the American West, Artist Paco Young lived near the Gallatin River outside of Bozeman, MT, with his wife and young son in an environment that provides constant and ever-changing inspiration for his art. He remained passionate about each painting because he paints familiar subjects that he loves. 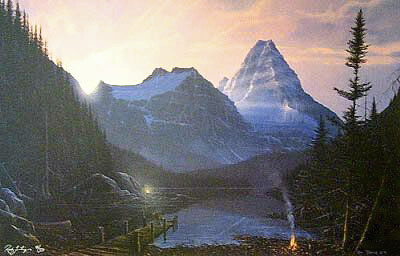 Young's favorite way in which to work is painting in plain air, or outdoors on location. This technique has also has taught him the most about painting. Young's subjects are almost entirely derived from trips to nearby Yellowstone, Grand Teton and Glacier National Parks. He says, "There's an endless source of inspiring subject matter in the Northern Rockies. 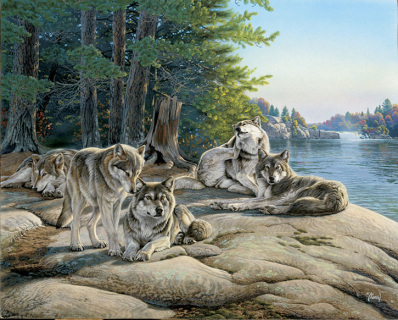 While I may include wildlife or figures in my paintings, they are usually secondary or lend support to the landscape. My paintings are often more about paint itself than the subject depicted because I find so much pleasure and excitement in the simple process of moving paint and creating a real impression of life." Reflecting a level of maturity that comes from years of passionate work and dedication, Young's paintings have evolved into a painterly style well-suited to convey the wild beauty of his surroundings. During a career that spans more than 20 years, Young has traveled extensively and exhibited at hundreds of gallery and museum shows including the Leigh Yawkey Woodson Art Museum, C.M. Russell Museum, Gilcrease Museum and the Trailside Galleries. The National Park Service commissioned him to do a painting of Old Faithful, the famous geyser in Yellowstone National Park. Young's 4' x 6' original Autumn Brilliance oil has now been permanently installed over the grand fireplace at the historic Old Faithful Inn. Image size (inches): 12" x 9.25"
Edition Size: Open plate signed by the artist. 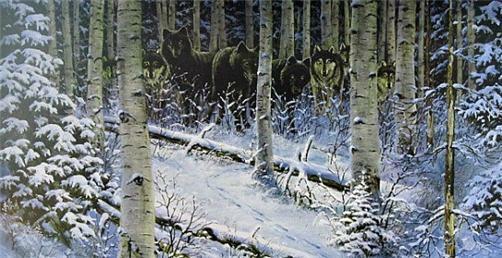 Arctic Wolves by Al Agnew. 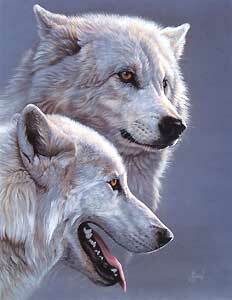 A beautiful head study of a pair of white arctic wolves, one male and one female against a blue back drop. Image size (inches): 14" x 28"
A buck takes a quiet moment to graze at meadows edge in this serene fine art print by artist Larry Chandler. Image size (inches): 19" x 29"
Edition Size: 2400 numbered and hand signed by the artist. Form: limited edition Offset Lithogaph on paper. Edition Size: 2842numbered and hand signed by the artist. Form: Offset Lithograph on paper. 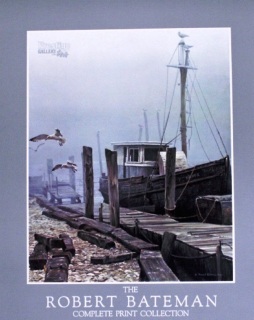 Edition Size: open and hand signed by the artist. Silent Shores - Log Cabin by Darrell Bush. 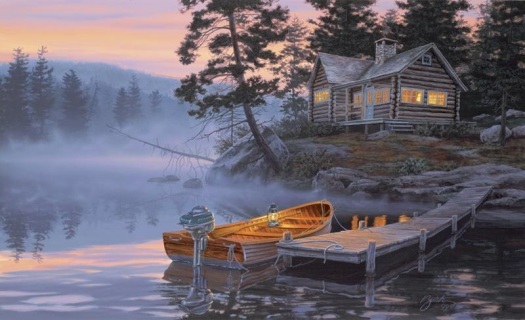 This is a great painting of A log cabin with the old fishing boat all loaded up and ready to go, A thick fog bank has made visibility difficult but the rising sun will burn it away soon. 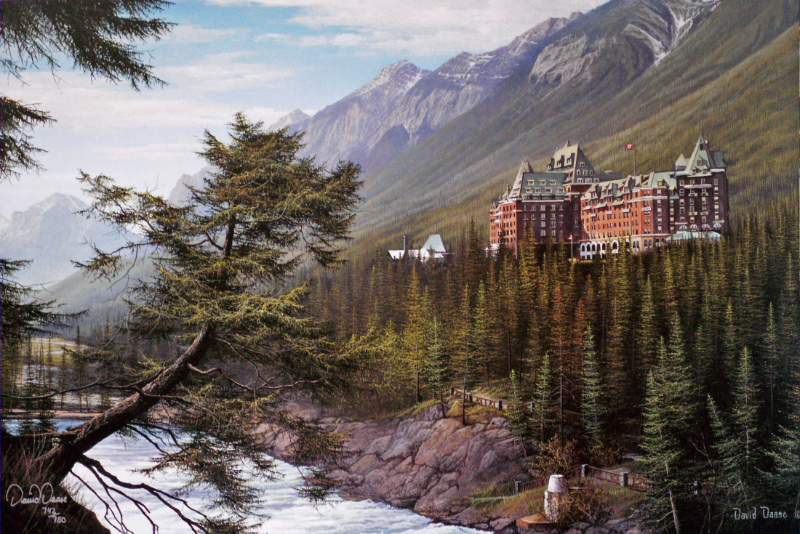 This is a great print for the outdoors person in your life. Edition Size: 400 numbered and hand signed by the artist. hunting trip to our favorite spot in the woods, "Hunter's Cove". 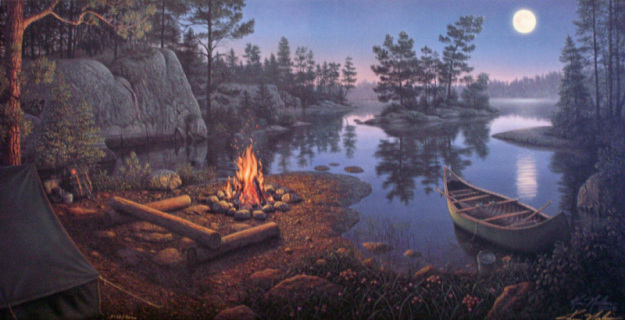 Whether he is revealing a springtime lake as winter's ice is slowly receding or picturing the perfect camp site Darrell Bush is carving his niche as one of America's favourite outdoor artists. "I feel that this release actually defines the term, 'Cabin Fever,'" he says. "It reminds us of our feverish anticipation to open the cabin up north after enduring a long, cold winter." He has more then 150 limited edition lithographs and collector prints plus over fifty limited edition collector plates to his credit. There are also scores of incentive and special commission art products on the market bearing his name. Thousands of collectors worldwide enjoy his work. Admirers and peers alike are always looking forward to the new projects that emanate from Derk's Saddle Tramp Studio. 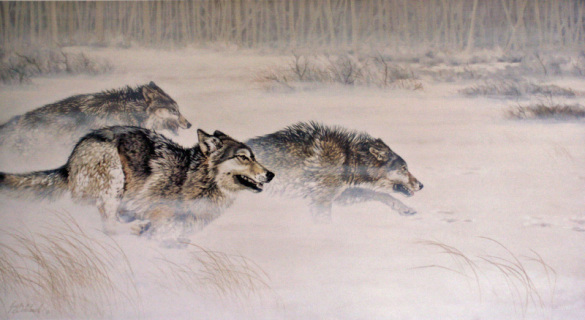 Derk has managed to stay as elusive to the public, as some of the wildlife he so beautifully represents in his work. Derk is an adventurer and a dreamer, managing to do for a living what most of us can only fantasize about. He shares his experiences with us through his artwork, so vividly, that we feel that we are there too. New mint condition with certificate of authenticity​. Mayer’s Master of the North was selected to join Ducks Unlimited Canada’s. (DUC) 2012 National Art Portfolio and Mayer was named DUC’s Artist of the Year. The money raised through this program supports DUC’s on-the-ground wetland conservation work, scientific research and education programs. 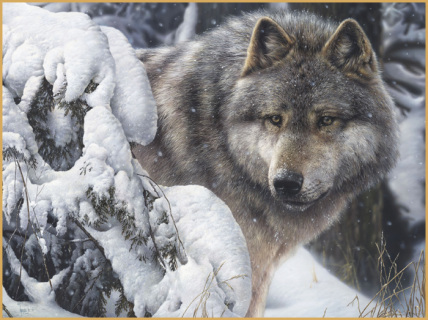 The hypnotic eyes of the wolf pierce the silent, wintry landscape as the beautiful animal remains vigilant Maybe this consummate hunter is watching its prey or enjoying a quiet respite from the pack. Canadian artist Denis Mayer Jr. has earned international acclaim for his unique style of wildlife painting that offers not only remarkably realistic representations but also images infused with energy, vitality and warmth. A native of Québec City, Denis knew from childhood that he would be an artist. He initially worked with his father, a commercial sign painter. This training served as a foundation as he privately explored drawing in charcoal, bringing his talent for capturing detail to depictions of both still lifes and built structures. He then worked for many years creating accurate and appealing architectural renderings as well as commercial illustrations for advertising. 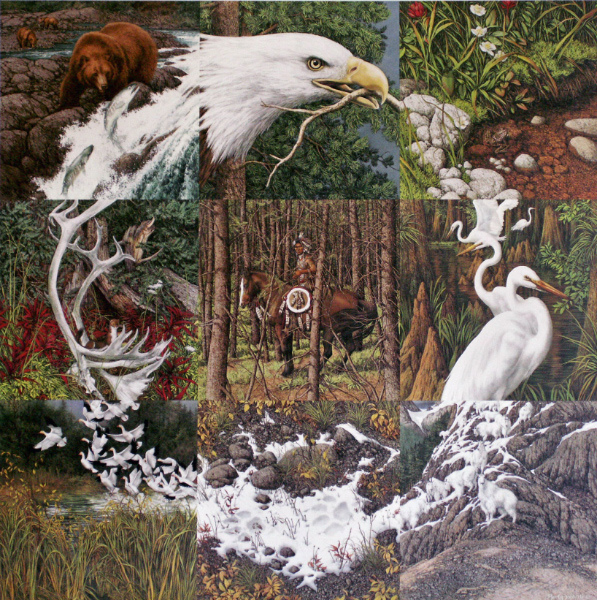 A dedicated conservationist and member of the international organization, Artists for Conservation, Denis has contributed to fundraising for organizations that include World Wildlife Federation Canada, Québec Wildlife Federation, and the Art of Nature. 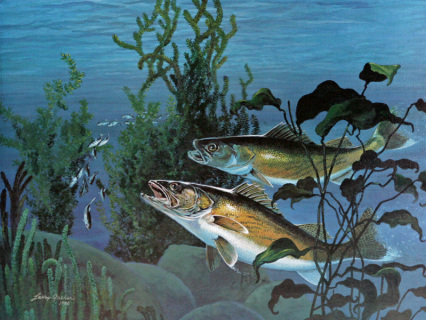 His work was selected for the Art Portfolio through Ducks Unlimited in 2007-2009. Denis lives in Vancouver, British Columbia with his wife and three children and loves to walk the area's woodland trails with his kids. He also listens to both live and recorded music and is passionate about Italian opera which he plays while he is working. Having achieved success as a master illustrator, Denis looked for and found his greatest challenge and passion - wildlife painting. Inspired by the work of Belgian naturalist and artist Carl Brenders, Denis now works exclusively as a wildlife artist, using mixed media and limited colours that reflect what he sees as the natural palette.